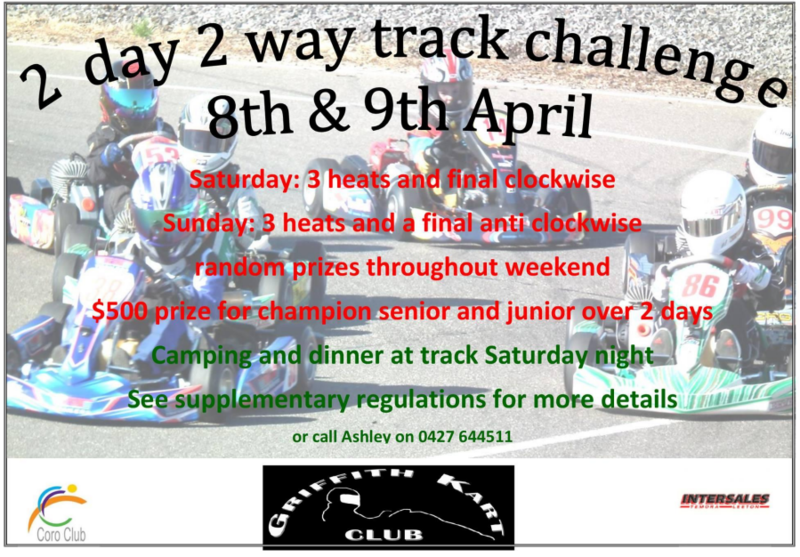 All karters are invited to compete in the 2017 2-Day | 2-Way Track Challenge on Saturday April 8 and Sunday April 9, 2017. Held at the Griffith Kart Club race circuit, Whites Road Tharbogang the club is looking forward to hosting a very successful event this year. Get your karts out and get your mates excited…. 2 full days of racing! Clockwise Saturday, Anti Clockwise Sunday The Junior and Senior Champions are taking home $500 each. Other random prizes and giveaways throughout the weekend. Camping available at the track with dinner available Saturday night. We will get the racing started early on Sunday to ensure everyone who has to travel will get away at a reasonable time.